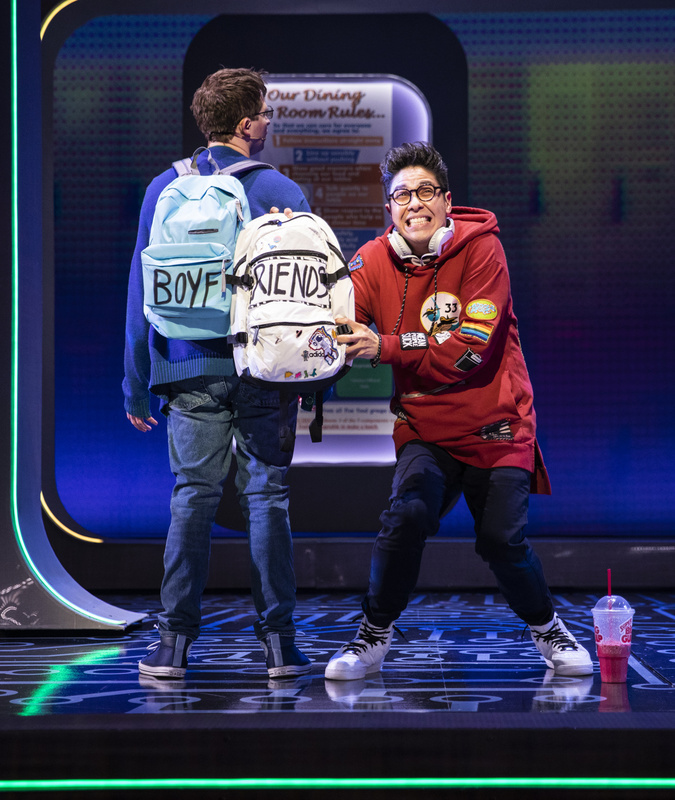 Still trying to “chill out” after seeing the social media cult sensation sci-fi cautionary teenage tale of woe musical BE MORE CHILL at the Lyceum Theatre on Broadway. Not altogether ready to give the production the cold shoulder but extremely close to it. Based on a 2004 young adult novel by Ned Vizzini this overlong and kinetic energy infused production boasts over forty producers above its title, last of which is “and Two River Theater” in Red Bank New Jersey where it all began in 2015. 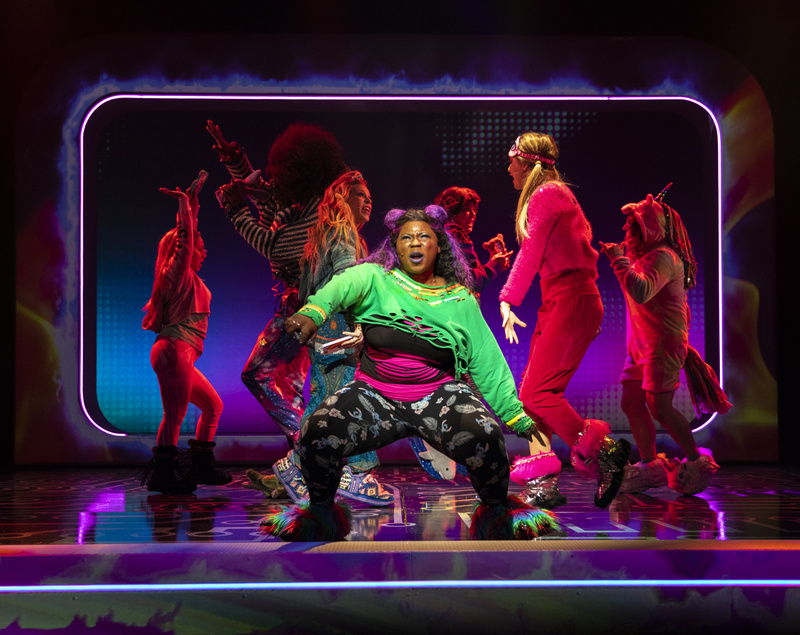 That led to a gazillion teens discovering it; spreading and bursting the score into the teen musical comedy scene on social media which in turn led to an off-B’way production this past summer which in turn has landed at the Lyceum with questionable results. BE MORE CHILL is for teens. I am not a teen. I am happy not to be a teen. However teens or their parents are scooping up tickets and by their reaction in the audience one would think the cure for acne has been discovered. The discovery would be better if it was for teenage angst. Of which there is plentiful amounts on view. Case in point. Our hero. Jeremy Heere. Portrayed by a wonderful actor Will Roland who is a cross between Arnold Stang (google him) and Kermit and Seymour Krelborn from LITTLE SHOP OF HORRORS. He feels inferior. He doesn’t know what to do. So he secretly masturbates. He is bullied. Wants to fit in. Has a best friend, Michael for 12 years. Ah Michael…everyone knows who Michael (George Salazar) is from the most popular song from the show “Michael in the Bathroom” where he has locked himself – lamenting his inability to join in the Halloween festivities. He just doesn’t fit in too. Speaking of which is love interest of sorts Christine (Stephanie Hsu) a theatre nerd. It seems that all misfits gravitate towards the theater in teen comic book land and she is no exception. She along with all the other one dimensional characters will be mounting a Shakespeare inspired production of A MIDSUMMER NIGHTS DREAM (which is no KISS ME, KATE) rechristened A MIDSUMMER NIGHTMARE. You get the tone of the show. But wait. The tattooed Rich (Gerard Canonico) has a cure for Jeremy. It’s a pill with a computer. From Japan. To be taken with Mountain Dew. Called a Squip. 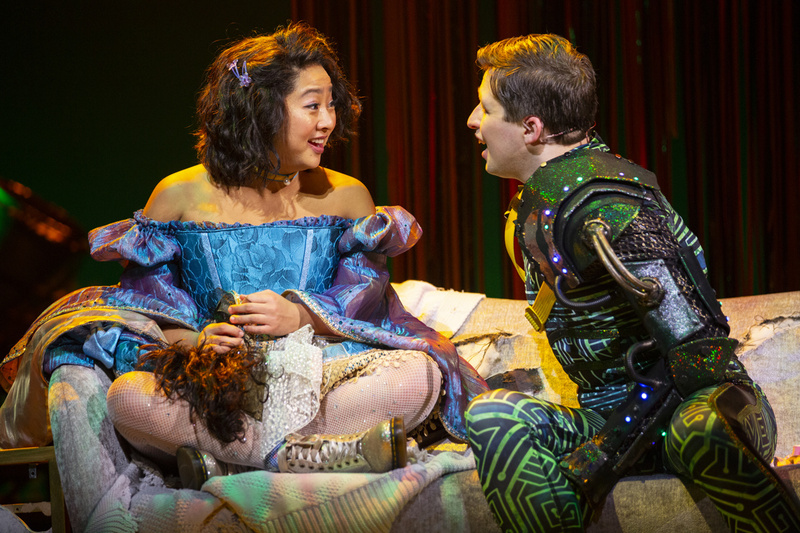 Personified by a seductive Jason Tam as The Squip. Could easily be mistaken for a used car salesman or the devil or someone who wants to control all the minds of all the people who take it thinking it will improve their lives and help them…not be cool…but to be more chill! Other characters in this concoction include a couple of Mean Girls – Chloe (Katlyn Carlson) and Brooke (Lauren Marcus) who seem to have wandered in from the musical of the same title. Jake (Britton Smith) a jock who goes from one mean girl to the other and Jenna (Tiffany Mann) who wails away in typical American Idol fashion. The kids loved her. The squip gets them all to take a dose of his cure somewhat akin to the mass Jonestown massacre although not with such disastrous results. Last but not least is Jeremy’s refusing-to-wear-pants dad Mr. Heere (Jason Sweettooth Williams). Ever since mom left them. I guess she wore the pants in the family. Enough. Will they all suffer the consequences of the quick Squip easy fix to their lives, or will they suffer the consequences? The choreography (Chase Brock) is mostly stylized synchronized movements (hand and feet and head) that reaches its zenith with a goose stepping squad of Squips. 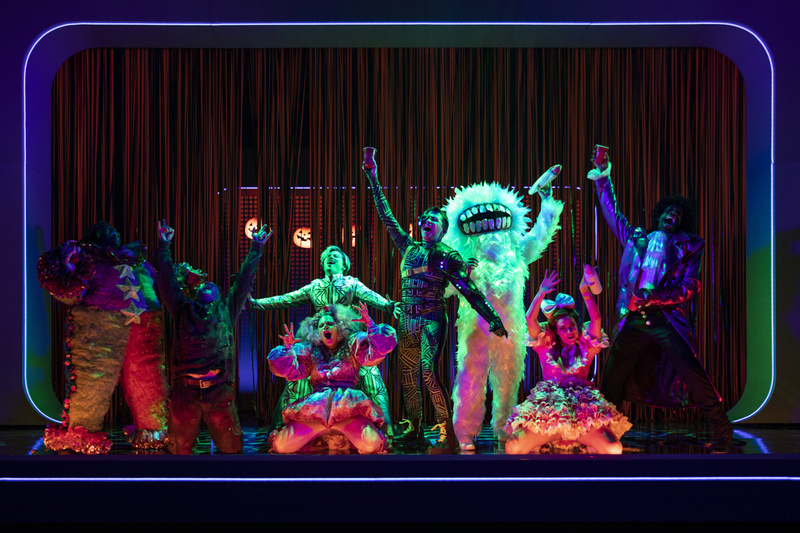 However there is a kaleidoscope of bizarre and colorful costumes in the aforementioned Halloween opening second act number that stun the eyes by Bobby Frederick Tilley II. Superb neon lighting by Tyler Micoleau. Quick changing set designs by the ever brilliant Beowulf Boritt that keep up with the frantic pace of director Stephen Brackett. It’s unfortunate that the book by Joe Tracz doesn’t quite make the grade. BE MORE CHILL just tries too hard.